When Chuck and Cyndi first met, Chuck drove a hot rod – a 70s Chevelle, complete with racing stripes. The car was cool – it even had a name, Old Gold. Well the relationship progressed and Chuck wanted to make this a permanent deal. But, as often is the case with young love, money was tight. So he sold Old Gold for a diamond solitaire engagement ring. Over the years, Cyndi had Scott restyled her ring several times, and eventually got a new diamond for her engagement ring – a stunning 1ct round diamond. She put the original diamond away, not knowing what to do with it. She recently came to our store, Scott’s Custom Jewelers, to have her ring re designed again into something a little more modern. We made an appointment and had her bring in all of the pieces that she no longer wears, so that we could see what else we had to work with. Cyndi wanted to showcase her center diamond, so we suggested a custom diamond halo to really boost up the size. 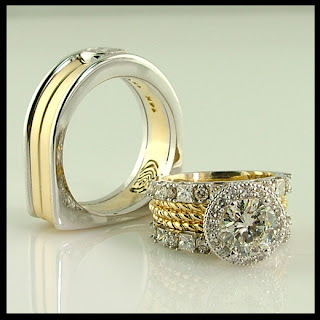 She also wanted a ring that went with all of her jewelry, both fine and costume, so we worked together and designed a 14k white gold and 18k yellow gold beauty, with rich roping in the center, and smaller princess cut diamonds mixed with round diamonds on the outside bands. And because she had a skin sensitivity to white gold, we crafted a custom sleeve of 18k yellow gold that lined the inside. She traded in her gold scrap towards the new piece, and used all of her diamonds, except the original. Since Chuck originally gave her that diamond, she saw it was only fitting that she return it back to its owner. We made him a gorgeous 14k yellow and white wedding band that matched his favorite watch. And we set Old Gold in the center. How’s that for full circle!